GitHub Pages is now running the latest major version of Jekyll, Jekyll 3.0, and from now on will only support kramdown, Jekyll's default Markdown engine. Also, Rouge will be the only supported syntax highlighter going forward, which means that you no longer need to install Python and Pygments to preview your site locally. Jekyll 3.0 offers several improvements for previewing and optimizing your site locally. For one, local builds are significantly faster, meaning you can preview your changes in near real time, and with incremental regeneration support (experimental), builds can be even faster still. Two words of caution, too. First, Jekyll no longer supports relative permalinks. This has been the default since Jekyll 2.0, and is only an issue if you explicitly added relative_permalinks: true to your site's configuration. Second, GitHub Pages will no longer support Textile. If you are currently using Textile (Redcloth) to author your Jekyll site, you'll need to convert your site to use Markdown instead. To add an Issue template to a repository create a file called ISSUE_TEMPLATE in the root directory. A file extension is optional, but Markdown files (.md) are supported. Markdown support makes it easy to add things like headings, links, @-mentions, and task lists to your templates. Pull Request templates follows the same pattern: add a file called PULL_REQUEST_TEMPLATE to the root directory of your repository. You can also put these files in a .github/ folder if you don't want them in your root directory. 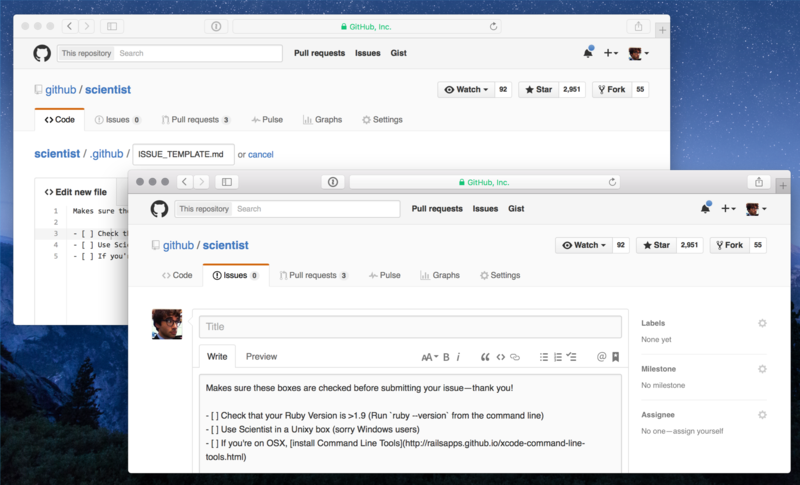 For all new GitHub features, check out GitHub's own blog.